The newest Marvel movie to journey home, Dr. Strange, will challenge your mind while thrilling you with daring action sequences. I received this movie for free in order to facilitate this review, but all opinions are my own. As a fan of Marvel hero movies like Thor, Captain America, and The Avengers, I was excited to see Dr. Strange although I had never heard of his character. Fans of the comic books already knew what to expect, but I went in with an open mind trying not to compare it to anything else. The movie starts out introducing us to the cocky and arrogant Dr. Strange who is a brilliant neurosurgeon and acts like his is a gift to the world. His pompous attitude gets him into trouble in relationships, and eventually is the cause of a terrible car accident that leaves him shattered. We follow him through his difficult recovery and search for answers. His questions lead him to Kamar-Taj, which only gives him more questions and forces him to look beyond himself. I will say that up until this point, the movie was a bit slow going. I did not watch it with the kids, but I can't imagine that they would have sat still long enough to get to the more exciting parts. Dr. Strange begins a transformation that places him in the role of defender and protector against dark forces. Without ruining all of the details for you, I will say that the action scenes have stunning visual effects and had me on the edge of my seat. This movie forces you to think and really pay attention to understand what is going on. It almost reminded me of a plot similar to "The Matrix" and I know that I will need to watch it a second time to get a better grasp on what was happening. You can bring home Dr. Strange on Blu-ray 3D™, Blu-ray, Digital SD, DVD or watch it On-Demand on February 28th, 2017. From Marvel Studios comes Doctor Strange, the story of world-famous neurosurgeon Dr. Stephen Strange (Benedict Cumberbatch), whose life changes forever after a horrific car accident renders his hands useless. When traditional medicine fails him, he travels to the remote Kamar-Taj in search of a cure, but instead discovers the mystical arts and becomes a powerful sorcerer battling dark forces bent on destroying our reality. 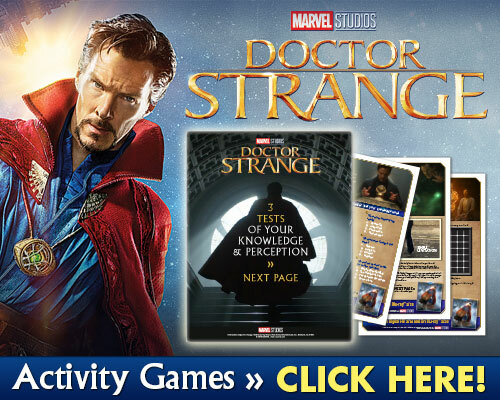 The film boasts an award-winning cast, including Benedict Cumberbatch (“The Imitation Game,” “Black Mass”) as Dr. StephenStrange, Chiwetel Ejiofor ("12 Years a Slave," “Triple 9”) as Mordo, Rachel McAdams (“Spotlight,” “Southpaw”) as Dr. Christine Palmer, Benedict Wong (“The Martian,” “Prometheus”) as Wong, Michael Stuhlbarg (“A Serious Man,” “Steve Jobs”) as Dr. Nicodemus West, Benjamin Bratt (“Traffic,” “Piñero”) as Jonathan Pangborn, and Scott Adkins (“El Gringo,” “The Expendables 2”) as Lucian/Strong Zealot, with Mads Mikkelsen (“The Hunt,” “Casino Royale”) as Kaecilius and Academy Award® winner Tilda Swinton (2007 Best Supporting Actress, “Michael Clayton”; “Julia”) as The Ancient One. The Blu-ray and Digital releases come packaged with over 80 minutes of fascinating, never-before-seen bonus materials, including five behind-the-scenes featurettes, five deleted scenes, hilarious outtakes, part two of the comical mockumentary “Team Thor,” audio commentary, and an exclusive look at the future of the Marvel Cinematic Universe.